Roy Medical Hall is the FIRST Unani Health Care Centre in Kerala established by Dr Mohammed Sharief Roy (M. S. Roy) in the year 1960. He was a renowned Unani Physician and dedicated his life to the Development and Promotion of Unani Medicine in Kerala - India. Hakim Dr Mohammed Sheriff Roy inherited the tradition of practising Unani from his father who belongs to a family of Hakims even practising at the court of Mughal Emperors. Almost all of our family members are practising Unani for ages all across the Country and even Abroad. 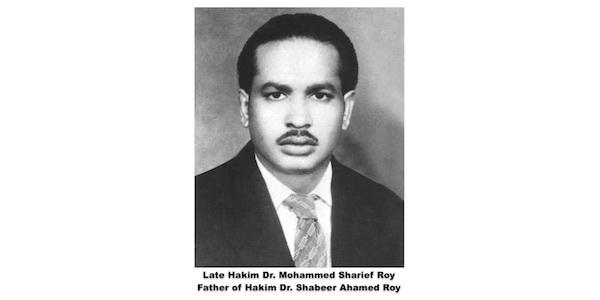 After Dr Mohammed Sharief Roy’s demise… his son Dr Shabeer Ahamed Roy (S. A. Roy) successfully running this family clinic. Roy Medical Hall provides cure and care using UNANI and AYURVEDIC medicines through Qualified Traditional Unani Practitioners and also Institutionally Qualified Unani (BUMS) and Ayurveda (BAMS) and Naturopaths Doctors; we offer service in different ways: i.e. through personal consultation at our clinic and via online Consultation Form for our Internet-savvy Patients across the World. We have done research and experiments during the last many years and discovered the results which speak for themselves. Our treatment is based on the scientific understanding that every person has a unique temporal constitution for a healthy body. Imbalance in temperament leads to disease. Once the cause is established, we offer personalised treatment via online consultation and deliver quality medication directly to our patients. Therefore we do not have any authorised medical shop or agency anywhere in India or Abroad. We have our own formulation utilising the plants that are based on ancient knowledge of herbs traditionally cultivated by members of one single family. Furthermore the formulate strategy include expensive ingredients like Kushta Nuqra, Asparagus, Saffron, Safed Musli, Cardamom, Almond, Pistachio, Cashew Nut, Walnut, Javitri, Gokshura, and Shilajit and the medication dispensed in the form of Pills, Majun (Layhem), and Tila (oil) along with Top Brand of Unani and Ayurvedic Tablets, Capsules as supportive medicine to manage stress, enhance immunity and for correct digestion. We take great care in providing the finest herbal products made at our own facility. These remedies are prepared to the highest possible standards, 100% hygienic and safe, efficacious and free from undesirable side effects. To add, we do not use any herbs prohibited or banned by the Department of Health in India. Our medicines are not only recognised and used in India but being a worldwide provider of natural Unani herbal medicines, we are accepted as a universal organisation of its own type. We have successfully completed 50 years (Golden Jubilee) in Unani Health Service; our patients are treated under the personal guidance of an expert team of physicians. We have reached such reputation that despite having the most advanced facilities of treatment in this country, the patients from all corners of the Kerala coming to renowned Roy Medical Hall to regain Vigour and Vitality. Our Medicines have been exported to Abu Dhabi, Dubai, Sharjah, Alain, Ajman, Ras al Khaima, Umm Al Quwain, Fujairah, Kuwait, Oman, Bahrain, Iran , Iraq , Jordan, Lebanon, Syria, Yemen, Saudi Arabia, Qatar, UK, USA, Maldives, Malaysia, Singapore, Japan and other countries as well.